a 1 feet tall 1st sphere is 8 feet above the ground. a 3 feet high and 1 feet wide cone is -0.8 feet in front of the 1st sphere. it leans 130 degrees to the front. it is -2.83 feet above the sphere. a 1 feet deep and 0.5 feet wide and 0.5 feet high 2nd sphere is -0.65 feet in front of and -0.55 feet right of and -1.05 feet above the 1st sphere. it leans 130 degrees to the back. 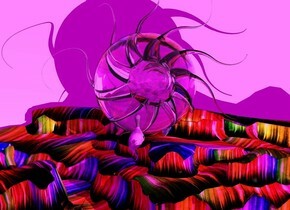 a 0.4 feet tall 3rd black sphere is -0.15 feet in front of and -0.45 feet right of and -0.85 feet above the 1st sphere. a 1 feet deep and 0.5 feet wide and 0.5 feet high 4th sphere is -0.65 feet in front of and -0.55 feet left of and -1.05 feet above the 1st sphere. it leans 130 degrees to the back. a 0.4 feet tall 5th black sphere is -0.15 feet in front of and -0.45 feet left of and -0.85 feet above the 1st sphere. a 0.4 feet wide and 0.1 feet deep and 0.02 feet high 1st black disk is -0.4 feet right of and -0.2 feet in front of and -0.3 feet above the 1st sphere. it leans 30 degrees to the left. a 0.4 feet wide and 0.1 feet deep and 0.02 feet high 2nd black disk is -0.4 feet left of and -0.2 feet in front of and -0.3 feet above the 1st sphere. it leans 30 degrees to the right. a 0.9 feet tall black hat is -2.1 feet in front of and -1.2 feet above the 1st sphere. it is facing north. it leans 45 degrees to the front. a 5 feet high and 2 feet wide black cone is -1.0 feet below the 1st sphere. the ground has the [fire] image. the [fire] image is 120 feet tall. a tiny ball. a 100 feet high and 500 feet wide clear wall is right of the tiny ball. it leans 75 degrees to the front. the sky is black. 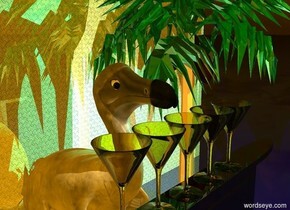 a 20 feet tall shiny dodo is 2 feet behind the wall. the sun's altitude is 40 degrees. the sun's azimuth is 160 degrees. the ambient light is red. 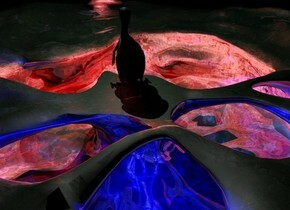 a blue light is in front of the dodo. there is a red light -50 feet in front of the wall. the black shiny table. A paper is 0.02 inches above the table. there is a 6 inch wide [dodo1] photograph -3 inches behind the paper. It leans 20 degrees to the front. there is a 6 inch wide [dodo_duck] photograph. It is -2 inches to the right of the paper. it is facing southwest. there is a 6 inch wide [dodod] photograph. It is -1 inches left of the paper. It is facing southeast. there is a 6 inch wide [noah] photograph. It is -1 inches in front of the paper. It is facing southeast. there is a 6 inch wide [flight] photograph above the paper. It is facing southwest. there is a 6 inch wide [fly] photograph right of and -3 inches behind the paper. It is facing south. there is a 6 inch wide [dodo_port] photograph 1 inches left of and -5 inches behind the paper. It is 0.01 inches above the table. It is facing the lamp. there is a 6 inch wide [dodo_marri] photograph in front of and -1 inches right of the paper. 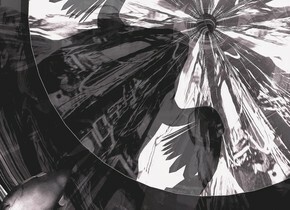 there is a 6 inch wide [dodo3] photograph 5 inches left of and in front of the paper. there is a 6 inch wide [dodo_port] photograph -1 inches left of and -1 inches in front of the paper. there is a 6 inch wide [dodo7] photograph 5 inches right of and -3 inches in front of the paper. 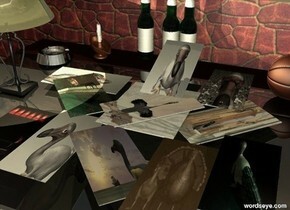 There is a green shiny first bottle behind the [dodo1] photograph. There is a small basketball 2 inches right of the [fly] photograph. There is a green shiny second bottle left of the first bottle. There is a green shiny third bottle 1.5 inches left of the second bottle. There is a shiny lamp 10 inches left of the paper. It is -1.3 inches above the table. There is a black shiny ashtray behind the lamp. It is above the table. there is a dune cream light -5 inches above the lamp. A candle is -4 inches behind and -2.0 inches right of the ashtray. It is facing southwest. the camera light is old lace. it is dusk. behind the table is a small [texture] wall. a 60 feet wide and 3000 feet deep brown road. A 20 feet tall dodo. It is above the road. A 1 feet wide white dull sphere. It is -2.0 feet above and -4.78 feet right of and -5 feet in front of the dodo. A 0.6 feet wide black dull sphere. It is -1.69 feet above and -4.39 feet right of and -4.62 feet in front of the dodo. A 1 feet wide white dull sphere. It is -2.0 feet above and -4.78 feet left of and -5 feet in front of the dodo. A 0.6 feet wide black dull sphere. It is -1.69 feet above and -4.39 feet left of and -4.62 feet in front of the dodo. a 1st ball is 100 feet in front of and 13 feet left of the dodo. a 2nd ball is 100 feet in front of and 30 feet right of the dodo. 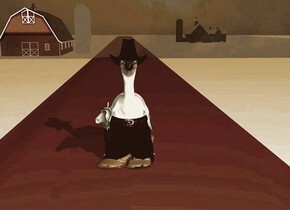 a 5 feet tall black cowboy hat is -3 feet above and -9 feet in front of the dodo. a 7 feet tall colt pistol is -16 feet above and -2.5 feet left of and -9 feet in front of the dodo. it is facing the 1st ball. a 23 feet tall black garment is -11 feet in front of the dodo. it is 13 feet in the ground. a 4 feet high and 7 feet wide and 8 feet deep coffee brown right army boot is -11.5 feet in front of and -7.3 feet right of the dodo. it is facing the 2nd ball. a 4 feet high and 7 feet wide and 8 feet deep coffee brown left army boot is -11 feet in front of and -7.1 feet left of the dodo. it is facing the 1st ball. a 50 feet tall barn is 250 feet behind and 30 feet left of the dodo. the sun's azimuth is 150 degrees. the sun's altitude is 30 degrees. a 50 feet tall 2nd barn is 600 feet behind and 100 feet right of the dodo. the ground is rye beige. the camera light is cotton cream. a 300 feet high and 1000 feet wide and 1 feet deep clear wall is 250 feet behind the dodo. it is 2 feet in the ground. it leans 20 degrees to the back. it is evening. setting the world on fire? the ground is shiny. a 100 feet wide and 200 feet high [color]cylinder. It is 11 feet in the ground. a 30 feet tall dodo is -170 feet above and -50 feet in front of the cylinder.it is facing southeast. the ground is translucent. it is night. the camera light is 80% black. there is a spicy gold light right of the dodo. 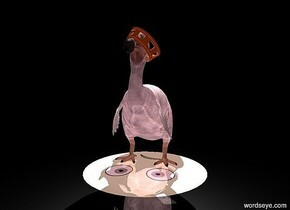 a 100 feet tall shiny world is -60 feet above and -60 feet left of and -135 feet behind the dodo. 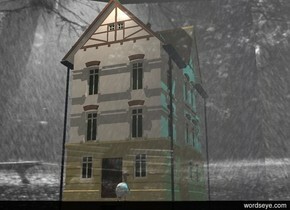 A house is facing east. 5 linen lights are 1.5 feet east of and -4 feet above the house. The sky is [snow]. The ground is dull black. A humongous flat transparent wall is 5 feet behind the house. 6 cyan lights are 3 feet behind and -4 feet above the house. Camera light is black. It is afternoon. The altitude of the sun is 80 degrees. Ambient light is dim pink mauve. a large dodo is 7 feet right of and -6 feet behind the house. It is facing west. a 10 feet tall silver turtle. the ground is translucent. The silver turtle is 9.8 feet in the ground. 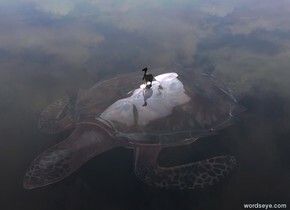 A dodo is -0.1 feet above the turtle. the camera light is black. it is afternoon. well... it was a short relationship. a 1 feet tall 1st sphere is 6 feet above the ground. a 3 feet high and 1 feet wide cone is -0.8 feet in front of the 1st sphere. it leans 130 degrees to the front. it is -2.83 feet above the sphere. a 1 feet deep and 0.5 feet wide and 0.5 feet high 2nd sphere is -0.65 feet in front of and -0.55 feet right of and -1.05 feet above the 1st sphere. it leans 130 degrees to the back. a 0.4 feet tall 3rd black sphere is -0.17 feet in front of and -0.49 feet right of and -0.92 feet above the 1st sphere. a 1 feet deep and 0.5 feet wide and 0.5 feet high 4th sphere is -0.65 feet in front of and -0.55 feet left of and -1.05 feet above the 1st sphere. it leans 130 degrees to the back. a 0.4 feet tall 5th black sphere is -0.17 feet in front of and -0.49 feet left of and -0.92 feet above the 1st sphere. a 0.4 feet wide and 0.1 feet deep and 0.02 feet high 1st black disk is -0.55 feet right of and -0.00 feet in front of and -0.5 feet above the 1st sphere. it leans 30 degrees to the right. a 0.4 feet wide and 0.1 feet deep and 0.02 feet high 2nd black disk is -0.55 feet left of and -0.00 feet in front of and -0.5 feet above the 1st sphere. it leans 30 degrees to the left. 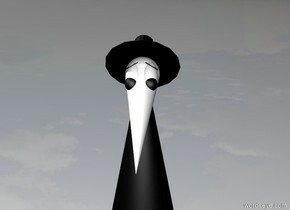 a 0.9 feet tall black hat is -2.1 feet in front of and -1.2 feet above the 1st sphere. it is facing north. it leans 45 degrees to the front. a 5 feet high and 2 feet wide black cone is -1.0 feet below the 1st sphere. A 20 feet tall first dodo is 100 feet behind the 1st sphere. it is above the ground. a 3 feet tall suitcase is right of the 1st sphere. It is above the ground. it is facing the 1st sphere. It is dusk. The camera light is black. a terracotta light is right of and in front of the 1st sphere. life is ... out of a blue sky. a 20 feet high and 20 feet deep and 10 feet wide first dodo is 0.5 feet above the ground. it has the [parrot] texture. the [parrot] texture is 25 feet tall. A 1 feet wide white dull sphere. It is -2.0 feet above and -4.78 feet right of and -5 feet in front of the first dodo. A 0.6 feet wide black dull sphere. It is -1.69 feet above and -4.39 feet right of and -4.69 feet in front of the first dodo. A 1 feet wide white dull sphere. It is -2.0 feet above and -4.78 feet left of and -5 feet in front of the first dodo. A 0.6 feet wide black dull sphere. It is -1.69 feet above and -4.39 feet left of and -4.69 feet in front of the first dodo. a 22 feet high and 19.5 feet deep and 12.8 feet wide second translucent red dodo is -21.7 feet above and -19.2 feet in front of the first dodo. A 1 feet wide clear dull sphere. It is -1.9 feet above and -5.82 feet right of and -5.3 feet in front of the second dodo. A 0.6 feet wide translucent black dull sphere. 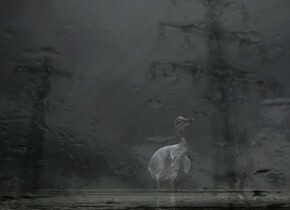 It is -1.69 feet above and -5.4 feet right of and -5.0 feet in front of the second dodo. A 1 feet wide clear dull sphere. It is -1.9 feet above and -5.82 feet left of and -5.3 feet in front of the second dodo. A 0.6 feet wide translucent black dull sphere. It is -1.69 feet above and -5.4 feet left of and -5.0 feet in front of the second dodo. the ground is shiny black. it is morning. the camera light is white. a shiny ground. the ground has the 1st [rain3] texture. the 1st texture is 100 feet tall. a 20 feet tall dull dodo. it leans 10 degrees to the back. it is 1.8 feet in the ground. 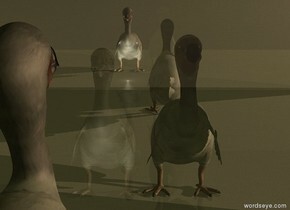 the dodo has the 2nd [image] texture. the 2nd texture is 10 feet tall. a 50 feet tall 1st tree is -25 feet behind and -8 feet left of the dodo. 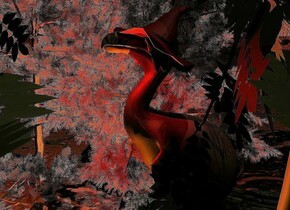 a 6 feet tall red hat is -5 feet above and -12 feet in front of the dodo. a 100 feet tall 2nd tree is -20 feet right of the dodo. a 40 feet tall 3rd tree is -15 feet in front of and -3 feet left of the dodo. a 40 feet tall 4th tree is 6 feet in front of the dodo. a 5 feet tall 5th tree is -10 feet right of and -10 feet in front of the dodo. a 50 feet tall 6th tree is 16 feet behind the dodo. it is night. the camera light is black. a dim lemon chiffon light is above the 2nd tree. a dim grasshopper green light is above and right of the 2nd tree. a orange light is -5 feet in front of and -17 feet above the dodo. a red light is -5 feet in front of and -4 feet above the dodo. A 40 feet tall unreflective black woman. a 7 feet tall 1st black dodo is -6.3 feet above and -8 feet in front of and -9 feet right of the woman. it leans 60 degrees to the front.it is facing southeast. a 7 feet tall 2nd black dodo is -6.9 feet above and -10.9 feet in front of and -6 feet right of the woman. it leans 10 degrees to the back. a 7 feet tall 3rd black dodo is -4.5 feet above and -8 feet right of and -11 feet in front of the woman. it leans 20 degrees to the front. It is facing north. 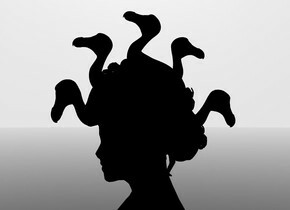 a 7 feet tall 4th black dodo is -6.6 feet above and -5 feet right of and -12 feet in front of the woman. it leans 60 degrees to the front. it is facing north. a 7 feet tall 5th black dodo is -4.5 feet above and -11 feet in front of and -6.5 feet right of the woman. it leans 20 degrees to the back. a 7 feet tall 6th black dodo is -4.5 feet above and -8 feet in front of the woman. it leans 0 degrees to the back. the ground is clear. the sky is white. the camera light is black. There is a 40 feet tall and 70 feet wide shiny cyan tile wall. A 20 feet tall first chrome gray dodo is in front of the wall. A 1 feet wide white dull sphere. It is -2.0 feet above and -4.78 feet right of and -5 feet in front of the first dodo. A 0.6 feet wide black dull sphere. It is -1.78 feet above and -4.37 feet right of and -4.65 feet in front of the first dodo. A 1 feet wide white dull sphere. It is -2.0 feet above and -4.78 feet left of and -5 feet in front of the first dodo. A 0.6 feet wide black dull sphere. It is -1.78 feet above and -4.37 feet left of and -4.65 feet in front of the first dodo. a 12 feet tall and 30 feet wide shiny black kitchen counter is in front of the dodo. a 5 feet tall 1st shiny orange cocktail glass is above the kitchen counter. a 5 feet tall 2nd shiny orange cocktail glass is left of the 1st cocktail glass. a 5 feet tall 3rd shiny orange cocktail glass is left of the 2nd cocktail glass. a 5 feet tall 4th shiny orange cocktail glass is right of the 1st cocktail glass. a 5 feet tall 5th shiny orange cocktail glass is right of the 4th cocktail glass. a 30 feet tall shiny dark green palm tree is right of the dodo. the ground is shiny dark blue. it is evening. the ambient light is orange. the sun's azimuth is 20 degrees. the camera light is black. there is a cyan light above and in front of the dodo. a white light is -3 feet in front of and -4 feet above the dodo. a 200 feet tall shiny translucent cyan clothes iron is 100 feet above the ground. it is upside down. the ground is translucent . the sky has the [galaxy] texture. the [galaxy] texture is 3000 feet tall. a 40 feet tall dodo is -60 feet above and -80 feet in front of the clothes iron. a 1st white light is above and in front of the dodo. a 2nd white light is above the dodo. a 3rd cyan light is 20 feet above the clothes iron. a 4th white light is in front of and -20 feet above the clothes iron. 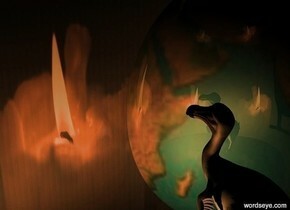 a fifth white light is in front of the dodo. A flower is 5 feet tall. The clear pyramid is 10 feet tall. It is 10 feet deep. It is 10 feet wide. It is -5 feet above the flower. The water rectangle is 40 feet wide. It is 40 feet deep. It is -10 feet above the pyramid. A silver ground. 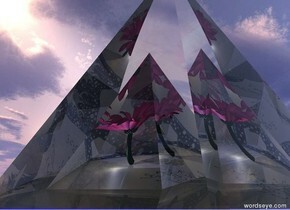 A clear pyramid is 20 feet tall. It is 20 feet wide. It is 20 feet deep. It is -0.1 inch above the rectangle. A blue light is above it. A dim orange light is 1 foot left of the flower. A dim white light is above the flower. A dim blue light is right of the flower. A white light is in front of the flower. A 10 feet tall [galaxy] shiny sphere. A 8 feet tall shiny copper pig. It is facing the sphere. the camera light is dim white.The ground is black. It is night. 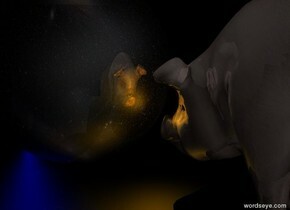 A dim white illuminator is left of the pig. 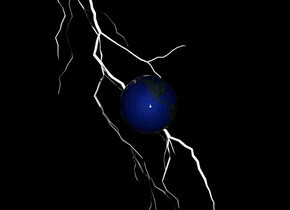 A blue light is right of the sphere. A dim white light is 4 feet above the sphere. A dim light is 2 feet above the pig. The orange light is right of the pig and 2.6 feet above the ground. A 200 feet tall and 300 feet wide and 0.1 feet deep silver shiny first wall. It leans 6 degrees to the front. A 200 feet tall and 300 feet wide and 0.1 feet deep translucent shiny second wall is 50 feet in front of the first wall. It leans 3 degrees to the back. A 50 feet tall dodo is 20 feet in front of the wall. It is facing the wall. It is 0.0 feet above the ground. The ground has the [image] texture. The camera light is black. It is dawn. A beige light is behind the dodo. 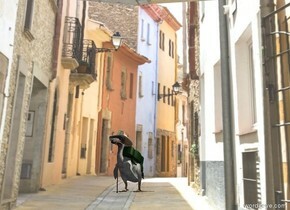 A second 50 feet tall dodo is behind the second wall and right of the dodo. The sky has the [image] texture. A 13 feet tall first [stone] cave is facing north. a 8 feet tall second [stone]cave is -20 feet left of and -11 feet in front of the first cave. It is facing north. a first sphere is 50 feet in front and 10 feet right of the second cave. A second sphere is 30 feet left of the first sphere. A third sphere is 20 feet right of the first sphere. A 30 feet tall first [stone] dodo is -30 feet above the second cave. A 30 feet tall second [stone] dodo is -29.5 feet above and -32 feet in front of the second cave. It is -22.2 feet right of the first dodo. It is facing the third sphere. A 30 feet tall third [stone] dodo is -30 feet above and -33 feet in front of the second cave. It is -16 feet right of the second dodo. It is facing the first sphere. 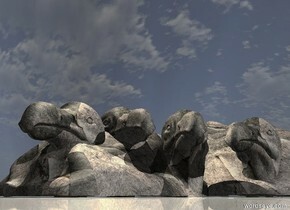 A 30 feet tall fourth [stone] dodo is -30 feet above and -38 feet in front of the second cave. It is -12 feet right of the third dodo. It is facing the second sphere. the ground is shiny. It is morning. The camera light is black. There is a old lace light 10 feet above and -10 feet in front of the second cave. 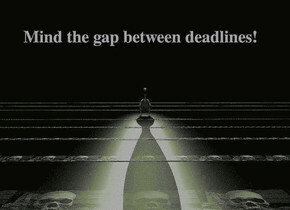 [stressed] dodo wisenheimer's words of wisdom: mind the gap! A 20 feet tall dodo. 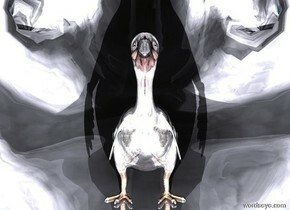 a 400 feet wide and 1 feet deep and 0.1 feet high first [skull] rectangle is 3 feet in front of the dodo. A 400 feet wide and 2 feet deep and 0.1 feet high second [skull] rectangle is 30 feet in front of the first rectangle. A 400 feet wide and 4 feet deep and 0.1 feet high third [skull] rectangle is 30 feet in front of the second rectangle. A 400 feet wide and 8 feet deep and 0.1 feet high fourth [skull] rectangle is 30 feet in front of the third rectangle. 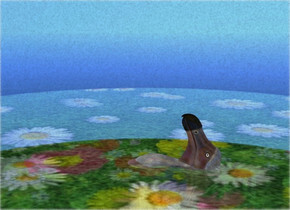 A 400 feet wide and 16 feet deep and 0.1 feet high fifth [skull] rectangle is 30 feet in front of the fourth rectangle. 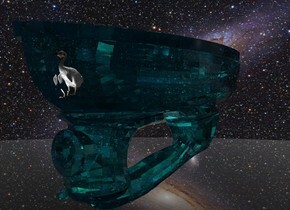 A 400 feet wide and 1 feet deep and 0.1 feet high sixth [skull] rectangle is 30 feet behind the dodo. A 400 feet wide and 1 feet deep and 0.1 feet high seventh [skull] rectangle is 30 feet behind the sixth rectangle. A 400 feet wide and 1 feet deep and 0.1 feet high eighth[skull] rectangle is 30 feet behind the seventh rectangle. The ground is shiny black. the sky is shiny black. It is night. there is a old lace light 3 feet above and 20 feet behind the dodo. the camera light is dim wheat. There is a bud green light 20 feet above the dodo. a 1.3 feet tall 1st beige rope [wood] sphere is 3.7 feet above the ground. a 0.3 feet tall 2nd beige rope [wood] sphere is -0.12 feet in front of and -0.72 feet above the 1st sphere. a 0.2 feet tall 3rd black sphere is 0.1 feet left of and -0.5 feet in front of and -0.16 feet above the 2nd sphere. a 0.2 feet tall 4th black sphere is 0.1 feet right of and -0.5 feet in front of and -0.15 feet above the 2nd sphere. a 3 feet high and 1.8 feet wide beige rope 1st [wood] cone is -3.9 feet above and -2.0 feet in front of the 1st sphere. a 3 feet high and 3 feet wide egyptian red 2nd cone is -3.3 feet above the 1st cone. a 1.2 feet tall egyptian red hat is -1.9 feet in front of and -1.45 feet right of and -0.8 feet above the 1st sphere. it leans 30 degrees to the back. a 0.03 feet high and 0.3 feet wide and 0.3 feet deep black 1st cylinder is 0.01 feet above and -0.2 feet left of and -0.40 feet in front of the 3rd sphere. it leans 20 degrees to the right. a 0.03 feet high and 0.3 feet wide and 0.3 feet deep black 2nd cylinder is 0.01 feet above and -0.2 feet left of and -0.38 feet in front of the 4th sphere. it leans 20 degrees to the left. a 0.3 feet tall and 0.6 feet wide black moon is -0.3 feet below and -0.35 feet in front of the 2nd sphere. it leans 110 degrees to the left. a 1.5 feet high and 1 feet wide and 0.5 feet deep 5th egyptian red sphere is 0.25 feet below and -0.8 feet right of and -1.3 feet in front of the 1st sphere. a 1.5 feet high and 1 feet wide and 0.5 feet deep 6th egyptian red sphere is 0.25 feet below and -0.8 feet left of and -1.3 feet in front of the 1st sphere. a 5 feet tall dodo is 1 feet right of the 1st sphere. it is above the ground. it is facing the 1st sphere. the camera light is black. the ground is shiny black. the sun is black. a wheat light is 1 feet above the dodo. a moccasin light is left of and in front of the 1st sphere. a shiny ground. a 2 feet tall ball. a 400 feet tall dodo is 100 feet in front of the ball. it is night. A red light is 100 feet in front of the dodo. a blue light is 400 feet behind the dodo. a grey light is 100 feet above and 10 feet in front of the dodo. the camera light is black. a shiny white ground. a 2 feet tall ball. a 400 feet tall dodo is 100 feet in front of the ball. it is night. A red light is 100 feet in front of the dodo. a blue light is 400 feet behind the dodo. a grey light is 100 feet above and 10 feet in front of the dodo. the camera light is black. 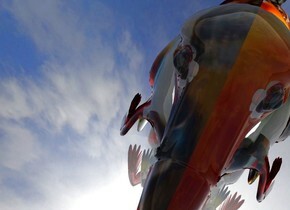 a 50 feet tall 1st chrome gray shiny dodo. the dodo is facing north. a 5 feet tall 2nd shiny dodo is -38.0 feet above the 1st dodo. it leans 30 degrees to the front. The camera light is black. 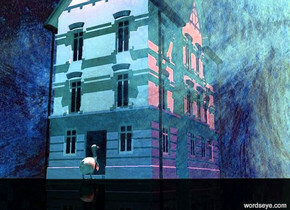 there is a white light in front of the 2nd dodo. A shiny 10 feet tall earth is 50 feet above the ground. the ground is clear. A 100 feet tall 1st shiny white lightning is -50 feet above and 5 feet behind the earth. it leans 30 degrees to the right. A 110 feet tall 2nd shiny silver lightning is -70 feet above and 10 feet behind the earth. It leans 20 degrees to the right. it is night. a 1st white light is behind and above the earth. the camera light is dim steel blue. a 2nd white light is 50 feet behind the earth. a 20 feet tall dodo is 50 feet in front of the earth. it is facing the earth. yet - a lousy soup. A 20 feet tall first dull chrome gray dodo. It leans 45 degrees to the front. A 1 feet wide white dull first sphere. It is -11.1 feet above and -4.75 feet right of and -4.66 feet in front of the first dodo. A 0.6 feet wide black dull second sphere. It is -0.79 feet above and -0.67 feet right of and -0.55 feet in front of the first sphere. A 1 feet wide white dull third sphere. It is -11.1 feet above and -4.75 feet left of and -4.66 feet in front of the first dodo. A 0.6 feet wide black dull fourth sphere. It is -0.79 feet above and -0.52 feet left of and -0.61 feet in front of the third sphere. A 60 feet wide and 40 feet high and 1 feet deep first [warhol2] wall is -20 feet behind the dodo. it is facing southeast. a 60 feet wide an 40 feet high and 1 feet deep second [warhol5] wall is -15 feet behind the dodo. it is facing southwest. it is -10 feet right of and -20 feet behind the first wall. 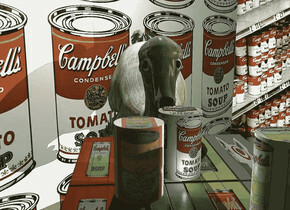 A 12 feet high and 10 feet wide and 12 feet deep [warhol3] table is -3 feet in front of the first dodo. a 3 feet high and 2 feet deep and 2 feet wide first [warhol4] cylinder is above the table. a 3 feet high and 2 feet deep and 2 feet wide second [warhol1] cylinder is left of and in front of the first cylinder. a 3 feet high and 2 feet deep and 2 feet wide third [warhol6] cylinder is in front of and 3 feet right of the second cylinder. the ground is shiny silver. the camera light is black. there is a 1st white light in front of the first cylinder. 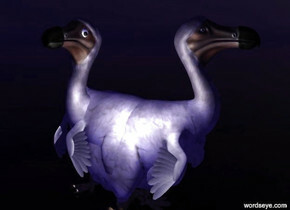 there is a 2nd white light above the dodo. it is dawn. A house is facing east. 2 linen lights are 1.5 feet east of and -4 feet above the house. The sky has the [rain2] texture. the [rain2] texture is 3000 feet tall. The ground is dull black. A humongous flat transparent wall is 5 feet behind the house. 2 cyan lights are 3 feet behind and -4 feet above the house. Camera light is black. It is afternoon. The altitude of the sun is 20 degrees. Ambient light is dim gray. a large dodo is 7 feet right of and -6 feet behind the house. It is facing west. A house is facing east. 2 linen lights are 1.5 feet east of and -4 feet above the house. The sky is texture. the texture is 5000 feet tall. The ground is dull black. A humongous flat transparent wall is 5 feet behind the house. 2 cyan lights are 3 feet behind and -4 feet above the house. Camera light is black. It is afternoon. The altitude of the sun is 20 degrees. Ambient light is dim gray. a large dodo is 7 feet right of and -6 feet behind the house. It is facing west. 10 green trees. 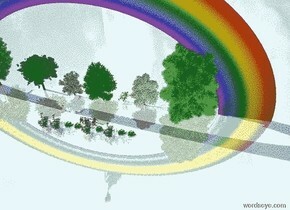 a 150 feet tall rainbow is -80 feet above the trees. 3 shiny men are in front of the trees. 3 shiny women are in front of the men. a baby is in front of the women. 10 roses are in front of the baby. the ground is shiny. a 50 feet tall dodo is above the rainbow. it leans 70 degrees to the front. a tiny ball. a black big building is 3900 feet right of the ball. it is above the ground. 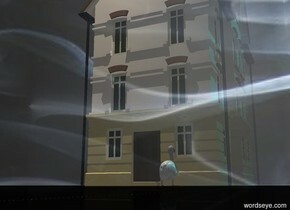 The dodo is in front of the building. The dodo is 7 feet tall. The ground is silver. The sky is [rain5]. A bright wheat light 10 feet above and 10 feet in front of the dodo. There is a black tree 4 feet behind and 8 feet to the right of the dodo. 200 feet high and 400 feet wide and 0.1 feet deep white shiny translucent wall is 40 feet right of the dodo. It is facing west. 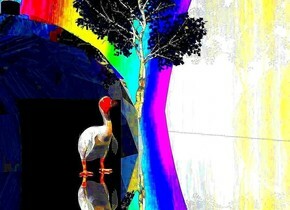 a 755 feet tall rainbow is -15 feet above and -355 feet in front of and 100 feet right of the dodo. it leans 10 degrees to the front. It is facing south. the camera light is black. 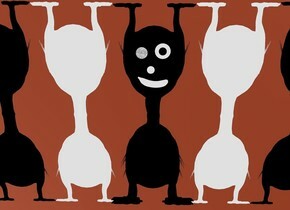 a black flat 1st dodo is upside down. it is -0.5 feet above the ground. a solid white flat 2nd dodo is right of the 1st dodo. it is upside down. a solid white flat 3rd dodo is left of the 1st dodo. it is upside down. a black flat 4th dodo is right of the 2nd dodo. it is upside down. 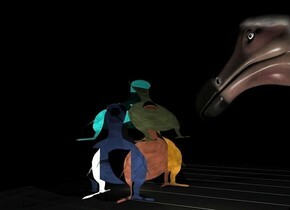 a flat black 5th dodo is left of the 3rd dodo. it is upside down. a 1st white 0.2 feet wide and 0.2 feet deep and 0.01 feet high disk is in front of and -0.7 feet above and -0.5 feet right of the 1st dodo. it leans 90 degrees to the front. a 2nd white 0.1 feet wide and 0.1 feet deep and 0.01 feet high disk is in front of and -0.9 feet above and -0.6 feet right of the 1st dodo. it leans 90 degrees to the front. a 3rd black 0.1 feet wide and 0.1 feet deep and 0.02 feet high disk is in front of and -0.65 feet above and -0.45 feet right of the 1st dodo. it leans 90 degrees to the front. a 6th flat black dodo leans 90 degrees to the back. It is -0.7 feet in front of the 1st dodo. it is above the ground. it is 2.5 feet high and 0.75 feet wide. a 4th white 0.15 feet wide and 0.15 feet deep and 0.01 feet high disk is in front of and -0.7 feet above and -0.43 feet left of the 1st dodo. it leans 90 degrees to the front. a 5th black 0.15 feet wide and 0.15 feet deep and 0.01 feet high disk is in front of and -0.7 feet above and -0.43 feet left of the 1st dodo. it leans 90 degrees to the front. 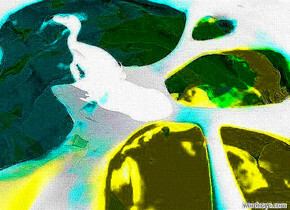 a 0.01 feet wide and 0.15 feet high and 0.4 feet deep solid white banana is in front of the 1st dodo. it is -1.1 feet above the 1st dodo. it leans 1 degrees to the front. it is facing east. the sky is cocoa. the ground is silver. the camera light is black. the ambient light is white. a 30 feet high and 60 feet wide and 30 feet deep white table. a 15 feet wide and 10 feet high flat coral 1st dodo is above the table. a 10 feet wide and 10 feet high flat orange 2nd dodo is -3 feet behind and -3 feet right of the 1st dodo. it is facing east. a 15 feet wide and 10 feet high flat white 3rd dodo is 4 feet behind the 1st dodo. it is facing north. 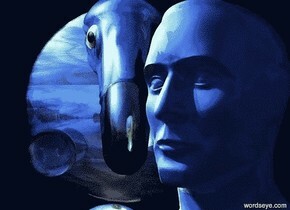 a 10 feet wide and 10 feet high flat night blue 4th dodo is -3 feet behind and -3 feet left of the 1st dodo. it is facing west. a 15 feet wide and 8 feet high flat hazel 6th dodo is -4 feet above and -2 feet in front of the 1st dodo. it leans 30 degrees to the back. a 15 feet wide and 8 feet high flat teal 7th dodo. it is -4 feet above and -1 feet in front of the 3rd dodo. it is facing north. it leans 30 degrees to the back. the camera light is black. a 1st dim old lace light is 2 feet behind the first dodo. a 2nd old lace light is 10 feet in front of and 3 feet left of the 1st dodo. the ambient light is black. the ground is black. the sky is black. it is night. a 42 feet tall 8th dodo is -12 feet in front of the table. it is facing north. it leans 40 degrees to the front. it is 10 feet above the ground. The ground is invisible. A sky. It has a [city] texture. The [city] texture is 3000 feet tall. A dodo is 100 feet above the ground. It leans 10 degrees to the front. It is noon. A beige light is right of and -0.5 feet above the dodo. There is a 1.5 feet wide and 0.01 feet high grey translucent unreflective disk -0.2 feet under and -1.4 feet behind the dodo. It leans 0.9 degrees to the front. There is a 0.3 feet wide and 0.01 feet high gray translucent unreflective disk -0.16 feet under and -0.2 feet right of the dodo. The camera light is dark grey. 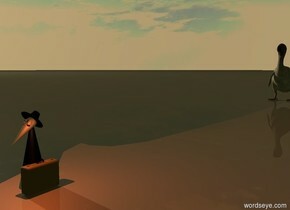 There is a 0.4 feet tall [texture]hat. It is -0.65 feet above and -1.85 feet behind the dodo. It is -1.0 feet right of the dodo. It leans 25 degrees to the back. There is a 1 feet tall cane -0.06 feet left of the dodo. It is facing the dodo. It is -2.15 feet above the dodo. There is a 1 feet tall backpack -1.7 feet above the dodo. It is facing south. It leans 70 degrees to the front. It is -0.75 feet right of the dodo. There is a beige light above the dodo. There is a beige light 1 feet above and 1 feet left of the dodo. A 200 feet tall first shiny [p2] sphere. A 150 feet tall shiny translucent second sphere is -140 feet above the first sphere. 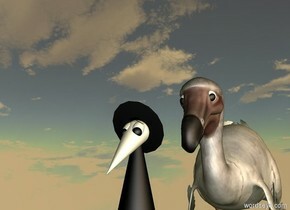 A 20 feet tall dodo is -100 feet above and -35 feet behind the second sphere. 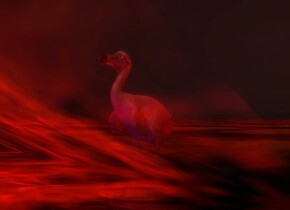 A pink light is 2 feet below the dodo. the camera light is dim hydrangea blue. a 19 feet tall third dodo is facing west. a 20 feet tall second dodo is -20 feet above and -14 feet right of the third dodo. it is facing east. 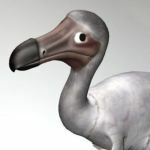 a 20 feet tall first dodo is -20 feet above and -7.0 feet left of and -16.9 feet in front of the second dodo. A 1 feet wide white dull sphere. It is -2.0 feet above and -4.72 feet right of and -5 feet in front of the first dodo. A 0.6 feet wide shiny black sphere. It is -1.82 feet above and -4.31 feet right of and -4.69 feet in front of the first dodo. A 1 feet wide white dull sphere. It is -2.0 feet above and -4.78 feet left of and -5 feet in front of the first dodo. A 0.6 feet wide black dull sphere. It is -1.69 feet above and -4.39 feet left of and -4.69 feet in front of the first dodo. The ambient light is 30% sea blue. The camera light is black. the ground is clear. it is evening. there is a old lace light 1 feet in front of and 1 feet right of the first dodo. it is -7 feet above the first dodo. girls are you ready? the males are finally gone! a 10 inch tall third dodo. the third dodo is leaning 15 degrees to the left. it is facing southwest.a 2nd 11 inch tall dodo is -1.3 feet right of the third dodo.the 2nd dodo is facing north.the 2nd dodo is leaning 16 degrees to the left.the ground is dull. it is dusk.the camera light is black. above the 2nd dodo is a dim blue light.the altitude of the sun is 2 degrees.the sun's azimuth is 180 degrees. A 4 feet tall door is 2 feet behind and -2.5 feet left of the third dodo. a 1.6 feet tall first dodo is -1.94 feet right of and -1 feet behind the door. 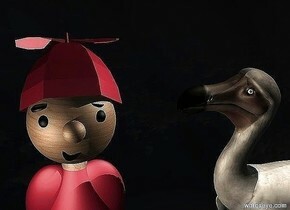 the first dodo is facing the second dodo. It leans 30 degrees to the front. it is 0.4 feet in the ground. the sky is rainbow.